Cleveland Cascades has announced that the shiploader that it supplied to Telestack Ltd has now been successfully commissioned on site in Ukraine. The 1100S Cascade system was ordered in December 2013 and dispatched to Telestack premises in February 2014. It was then cold-commissioned in Northern Ireland in July 2014, before being hot commissioned and placed into operation recently in November 2014. At 16.5m in extended length retracting to 6.2m, the chute loads grain and other agricultural products at rates of up to 650 tonnes per hour. The chute is mounted to Telestack's TS-550 Rail Mounted Loader, and has a luffing range of 14° to 27° to allow clearance for loading Panamax vessels when necessary. 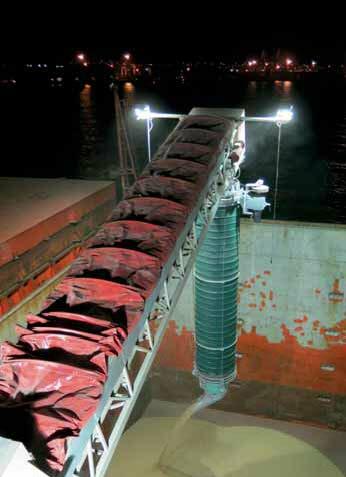 The chute also utilizes a trimmer outlet, which allows for detailed loading into hard-to-reach areas under the combings of the ship's hatches, as shown in the photograph, left.